The purpose of the present study was to evaluate the long-term incidence and timing of reactivation in patients with type 3 neovascularization who were treated with three monthly anti-vascular endothelial growth factor (VEGF) injections. 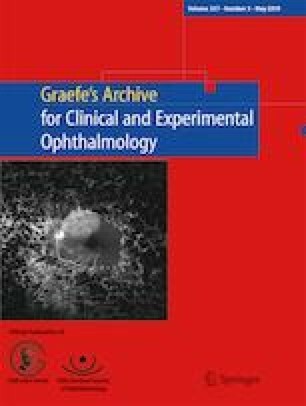 A total of 179 patients (179 eyes) diagnosed with type 3 neovascularization with dry macula after three monthly anti-VEGF loading injections were included in this retrospective study. After the initial treatment, patients were followed up without further injection until the first reactivation. The incidence and timing of the first reactivation after the initial treatment were recorded, and factors predictive of early reactivation (≤ 6 months after the third anti-VEGF injection) were investigated. During a mean follow-up of 37.5 ± 18.8 months, the first reactivation was noted in 145 patients (81.0%) at a mean of 6.6 ± 4.1 months after the third injection. In 94 eyes (64.8%), reactivation was noted 2–6 months after the third injection, while in 37 eyes (25.5%) it was noted 7–12 months after the third injection. In the remaining 14 eyes (9.7%), the reactivation was noted after this period. The incidence of early reactivation was higher in women (P = 0.014) and patients with thicker choroid (P = 0.026). In patients with type 3 neovascularization, almost all reactivation was noted within 15 months of the third anti-VEGF injection, suggesting the need for close follow-up and detailed examination during this period. Female patients with thick choroid should be monitored more frequently during this early period. Kim’s Eye Hospital (Seoul, South Korea) provided financial support in the form of funding for English editing support. The sponsor had no role in the design or conduct of this research. The study was approved by the Institutional Review Board of Kim’s Eye Hospital (Seoul, South Korea). This study was conducted in accordance with the tenets of the Declaration of Helsinki. Informed consent was not obtained in this study. Identifying information about participants was not presented in this study. This study was supported by Kim’s Eye Hospital Research Center.